Follow the Dour from near its source to the sea in this 5 mile (7.5lm) walk. The route is accessible for pushchairs and is quite flat, but wheelchair users may require assistance. The route crosses major roads, so care is advised if walking with young children. 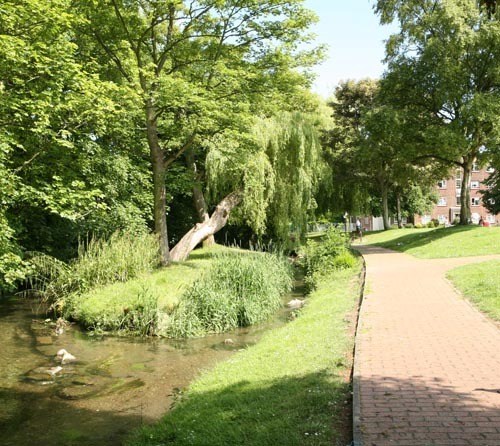 You can catch a train from Dover railway station to Kearsney railway station or a bus from Pencester Road to the start of the walk in River, either to begin your walk or to collect a car if you arrived at the walk start with your own vehicle. A system of QR smart-code way markers, which can be read with mobile phones, is planned for this route. Using your phone you will be able to follow the route and find out more about the places you visit and the people who lived and worked there. Permissions to put up the signs is currently being requested from land owners and local authorities. We are currently checking the walk routes so watch this page for downloadable walk routes and links to walk information coming soon.